TORONTO — Just as Kyle Lowry had Serge Ibaka's back on the penultimate play of the Raptors' 104-101 win over the Atlanta Hawks, the Toronto forward returned the favour in the dressing room. Lowry threw a pass to Ibaka with 17.1 seconds left in the fourth quarter that the six-foot-10 centre slammed through the Hawks' basket and into the face of Atlanta guard Jeremy Lin for a one-point lead on Tuesday night. Ibaka then pulled down a big defensive rebound on the next possession that led to another dunk by OG Anunoby for the game's final score. When Lowry faced the waiting media in front of his locker after the game no reporters had a question ready, so Ibaka stepped up and asked how he was feeling. "My guy Serge had a big dunk down at the end, had a great defensive rebound," laughed Lowry. "Serge played well tonight. We had a great team effort. Kawhi Leonard came up with some big stops down the stretch. Good team win. Any other questions?" "Leonard's making a really assertive effort to make some extra plays and try to be a little bit more aggressive in playmaking," said Lowry. "That's the stuff that we're gonna need from him because he commands such attention on the floor that he's gonna be able to get double-teamed, and he's gonna be able to find guys, and we've just gotta make shots for him." John Collins had 21 points, seven in the fourth quarter, for Atlanta (12-28), while Lin added 20 with nine assists. He told reporters earlier Tuesday that he wasn't quite ready to retire, despite being tied with Robert Parish, Dirk Nowitzki, and Kevin Garnett for longest playing career in NBA history. "I'm not a guy who likes to look back, I live in the now," said Carter, who got a standing ovation when he entered the game in the first quarter. "Over so many years I've seen so many things, gone through the ups and downs. The joy of coming to this arena, each and every year is something I look forward to." Lowry missed 10 of 11 games with a thigh contusion and then lower back pain, only appearing against his hometown Philadelphia 76ers on Dec. 22, before returning for Sunday's 121-105 victory over Indiana. Leonard sat that game out as Toronto continues to rest him for the second half of back-to-back games. 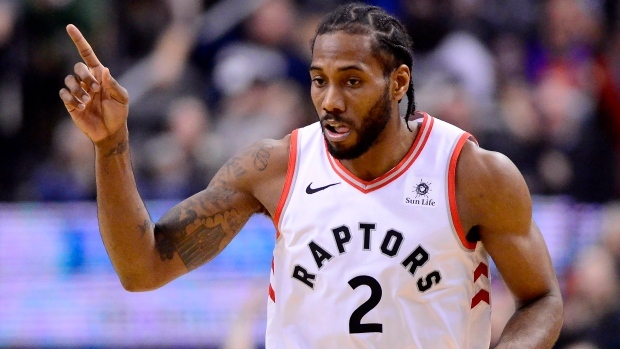 Lowry brought the sold-out Scotiabank Arena crowd of 19,800 to its feet with a three-pointer from the corner to tie the game 68-68 near the midway point of the third quarter. The momentum continued to swing the hosts' way with the Raptors taking an 80-77 lead into the final quarter. After exchanging field goals for the first four minutes of the fourth, Atlanta put together a 7-0 run capped by a Collins layup to take an 88-86 lead that forced Toronto to take a timeout with 8:20 left to play. Pascal Siakam made a layup when play resumed and then Leonard sank a jump shot off a bad pass by Lin to re-take the lead but Collins answered right back with a jumper. The back and forth play continued until the final minute of the quarter, with Leonard stealing the ball and leading the charge up the court. That sparked a series of passes that led to Lowry threading the ball to a wide-open Ibaka for the winning dunk. "We pulled one out. We were trying to get away from them and never really could," said Raptors head coach Nick Nurse. "And we were down late there and had to make a couple of stops, and a couple scores, and we did both of those things. So, pretty good. Pretty good. Happy we got the win, wasn't easy out there tonight."